Dispatch time 2-3 days - this bike is assembled in our workshop before dispatch. Minor assembly required on arrival, details supplied with bike. Great entry-level 20" trials bike! Ideal for riders 1.50m (5ft) - 1.80m (6ft). - A fantastic entry level trials bike from Onza! 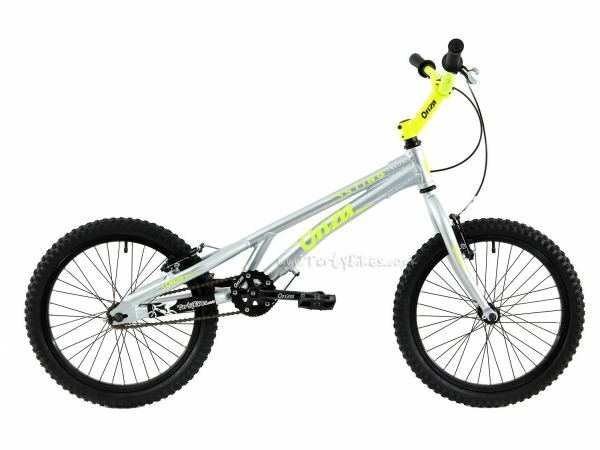 - This is a full size 20" bike ideal for riders from approximately 1.50m (5ft) to 1.82cm (6ft) in height. 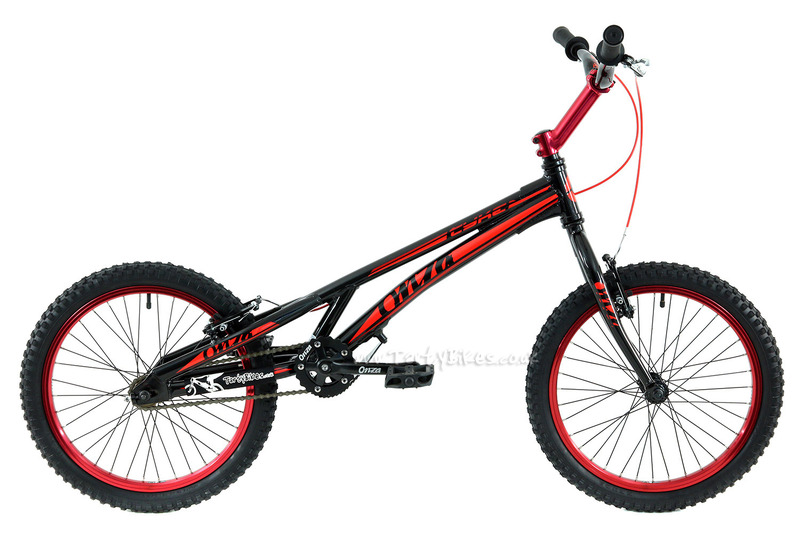 - High grade 6061-series aluminium frame with head tube reinforcing gussets. 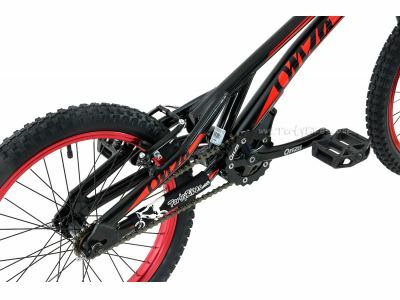 - Tough Onza cromoly curved blade forks with V Brake mount. - Powerful and easy to maintain 'V' brakes front and rear - upgraded brake pads can be fitted at minimal extra cost if you would like more power. - Standard 1 1/8" headset features a taper roller bearing on the bottom race for extra load capacity and durability. 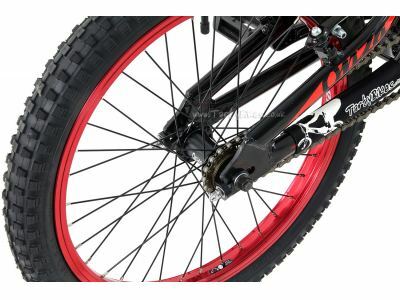 - Onza 36h single wall lightweight rims front and rear, with grippy Kenda 20" x 2.25" tyres. - Onza square taper crankset with a durable steel bashring and 24T steel chainring. - Bash/ski-plate fitted as standard (please note this is a chain protection device, it is not designed to be used to mount obstacles). 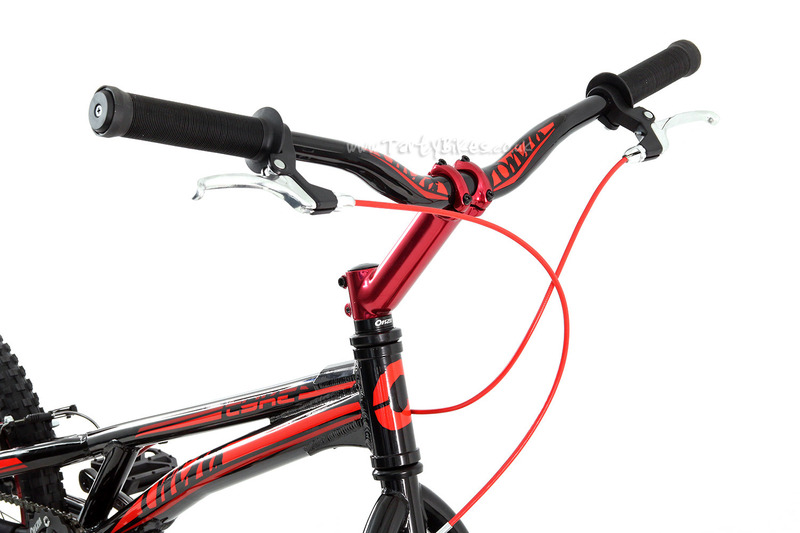 - Onza cromo riser 31.8mm trials handlebar, 680mm width. - Forged Onza alloy 31.8mm stem to reduce weight. - Durable plastic platform pedals with steel axles are simple and reliable. 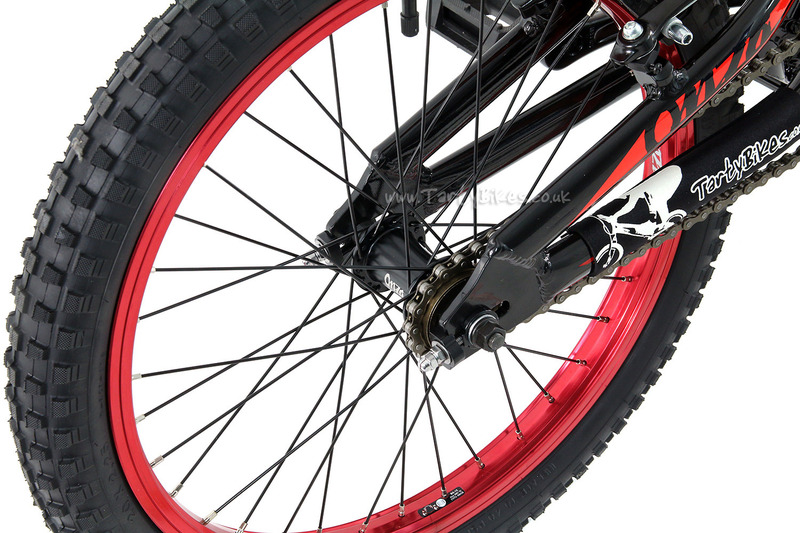 - 16T freewheel on the rear hub, running 24-16 gear ratio, perfect for trials riding. - Seatless design to reduce weight and increase stand over clearance. - Available in gloss black with red accents and parts. - Please note: Some bikes may have very minor paint chips. These are usually very minimal though. Hello! What are the tubes needed for the front and the rear wheel? So I can order these with the bike already, thank you! We have a range of spare tubes available, but in terms of price and quality the Maxxis Unboxed 20" Tubes are hard to beat. You can use them front and rear. I am about 6' 2" and about 190 lbs and am interested in trails what bike would be good for me? or am I too big for these kind of bikes? Will it be strong enough for street trials? Hello i am interested in a trial bike: i am: height :1.70 m weight:70 k i live in Israel, do you ship here..? if you do can you tell me what are the costs of the shipment.. i want to spend on the bike no more than 300£. So I am sure this is a ridiculous question, but I am 6'4", roughly 192CM tall. I am not looking for anything expensive to start on, but would this bike be ok under me? I ride a 20in bmx bike, so I dont think it would be that much different. If I bought the Onza Tyke would this be a good fit? If not, I would love a beginner suggestion. It would be appriciated! And much thanks! my crank keeps coming loose on my 2014 'onza tyke', I torque it down as much as i can with 'Allen sockets and bar' but it still comes loose after about 3-4 hours. i'd like to know what you suggest to keep it tight. 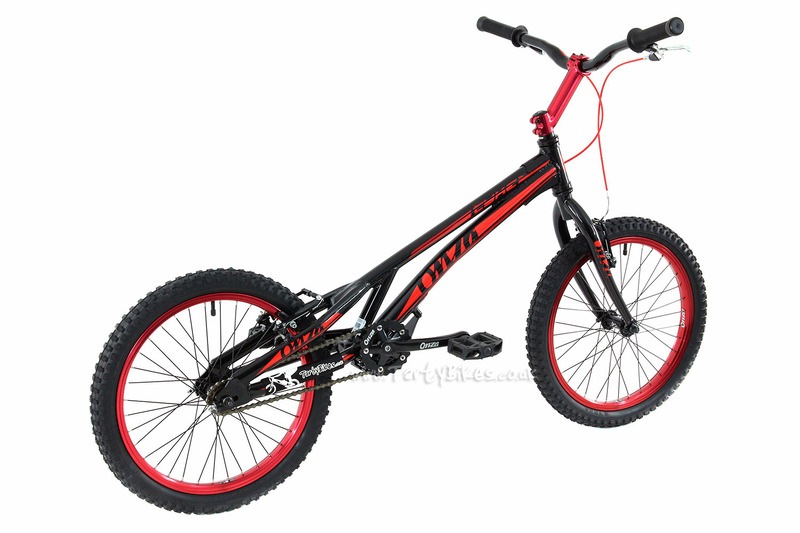 Hi i am a beginer and thing to buy ether this bike or onza zoot 24inc. I am 185cm, what would you suggest? Hi Alex -thanks for your question. 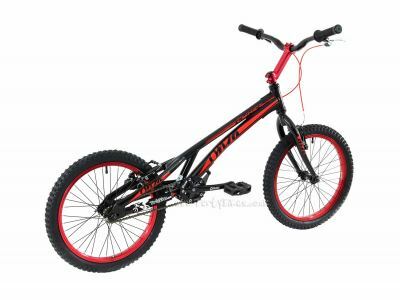 At that height, you would probably be more comfortable on the 24", though it largely depends on the style of riding you are interested in. Thanks, Flipp. Hi Lukas - you could fit hydraulic rim brakes to this bike if you wanted, but you would need to use Magura Evo2 adaptors. The blue model of this bike would fit you very well so that would be the one to go for, and just so you know; the orange model has been discontinued. Hope that helps. Thanks, Flipp. Hello again, I am confused if this bike is shipped out complete or would you have to set it up when it arrived? Hi Kai - thanks for your question. Before dispatch, we assemble and set the bikes up to 100% complete so that they're ready to ride. To get the bike to fit in the box, we then have to remove the front wheel, pedals and handlebar/stem combo. These are all very easy to fit, and if you need help with doing this we have an instructional video here: http://www.tartybikes.co.uk/media/guides/maintenance_bike_assembly/m4.html Hope that helps. Thanks, Flipp. How much does the smaller of the two weigh? Hi Kai - thanks for your question. Both models of this bike weigh 10.36kg. Thanks, Flipp. Hello im looking to get into trials! i was wandering what bike would be best out of the two. I am 138cm tall but im growing quite fast, Which one would you say for me to look to get as it would hopefully be for Christmas. i don't want to buy the smaller one and then shorty after need to get the bigger one as ive grow to big. Im really stuck on this!? Thanks. Hi Brett - thanks for your question. The sizes we provide are just a guide for what most people would find comfortable. If you're growing quickly, we'd probably recommend going for the larger bike, and if it feels too big when you get it you can temporarily fit a shorter stem. We have stems of many lengths available and all will fit this bike. You could use a shorter one until you've grown enough, and then put the original stem back on to feel comfortable again. Hope that helps. Thanks, Flipp. Hi Mary - thanks for your question. Yes, we regularly ship to all over the US. To see your shipping price, add your items to the shopping basket and go to place the order. You can put in your address and see what postage options are available to you and how much they cost, and you will not have to place the order if you choose not to. Thanks, Flipp. Hi Thomas - thanks for your question. The sizing of a bike is more related to your height than your age. 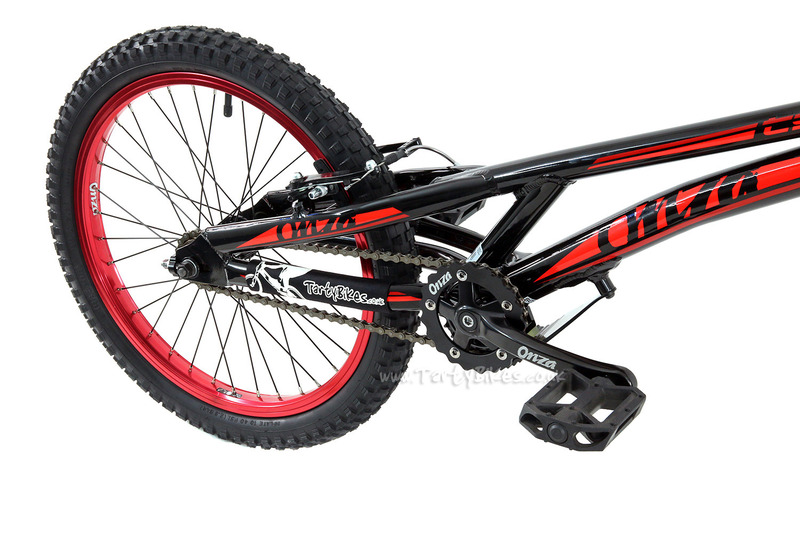 This would be a great bike for you if you are around an average height or taller 14 year old. If you are quite short for a 14 year old, a shorter stem might help make the bike more manageable for you. Hope that helps. Thanks, Flipp. Hi Jake - thanks for your question. Unfortunately you wouldn't be able to use a 19" rear wheel in that frame as the brake mounts are positioned for a 20" rear wheel so the pads would not line up with the rim. Thanks, Flipp. Hi! 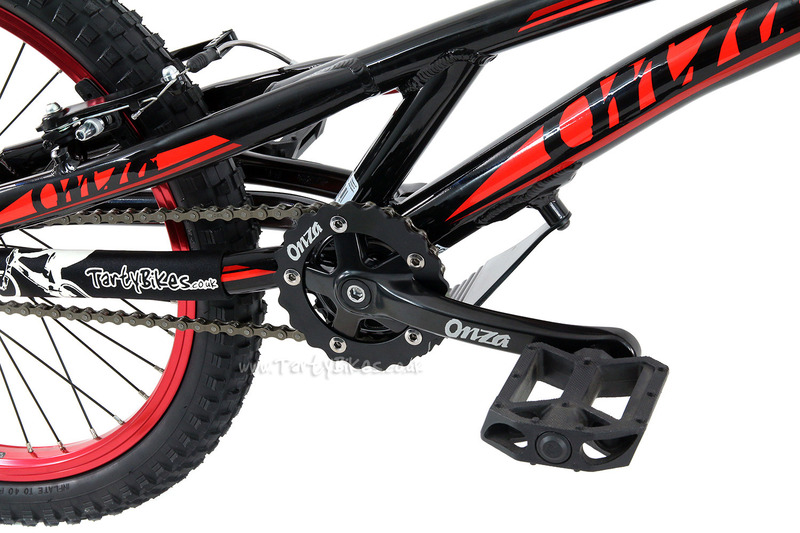 I was wondering what would be the main differences between the onza rip and the onza tyke? 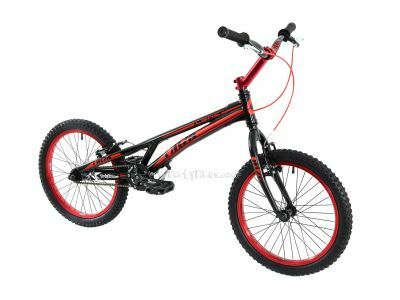 Also, is it easier to wheelie or hop on the back wheel of a trials bike compared to a bmx bike?Thanks! Hi Phil - thanks for your question. There are no major differences between the two bikes, but many minor ones. From our experience of building the bikes up, the Rip seems to be slightly better quality all over the bike. There is no one particular area where the Rip is better than the Tyke - everything just fits together a little better and runs a bit smoother. A trials bike will be much easier to hop around on the back wheel than a BMX as this is what they are specifically designed for. Hope that helps. Thanks, Flipp. Hi Liam - thanks for your question. Unfortunately you can't fit disc brakes to this bike as neither the frame and fork or hubs feature the necessary mounts. Thanks, Flipp. I am 5'6 5'7 ish and I race XC mtb bikes, I do dirt jumps and bmx, so I have spent a lot of time on a bike. 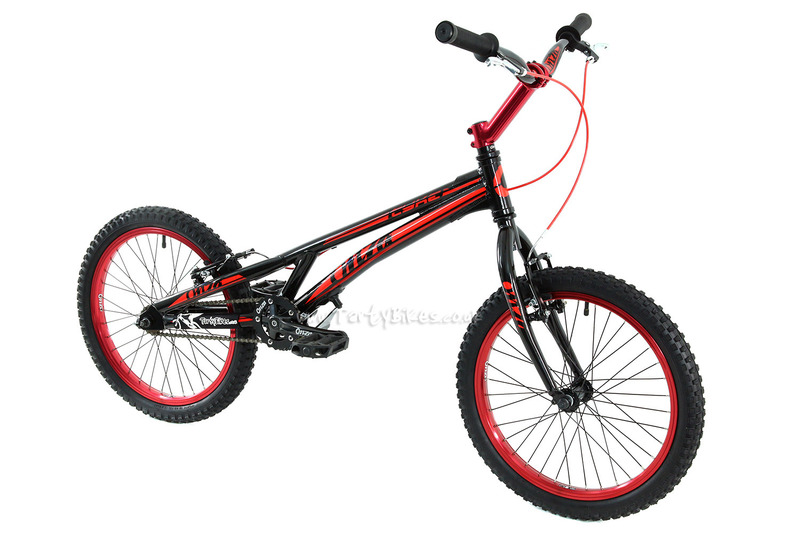 I have never done trials and that is why I would like to buy this bike, my question is, which one would be better for a begginner, the orange one or blue one. I did read the description but which be easier to learn on, the bigger one or the smaller on. (I am 13 years old) and how is the geometry different from a bmx or dirt jump, they look a lot different but does it make it easyier to do things like pedal kicks? Hi Logan - thanks for your question. 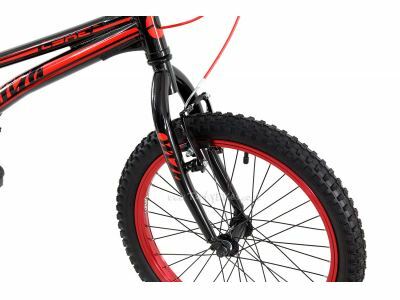 The size of the bike doesn't make it any more or less suitable for beginners - you should just choose the one that best suits your height the geometry is very different to a BMX - it is considerably longer, has a steeper head tube angle and higher bottom bracket. 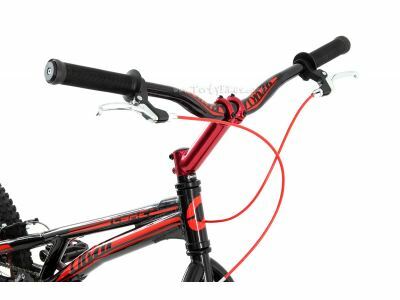 It also uses the trials style handlebar and stem which puts your weight much further forwards. 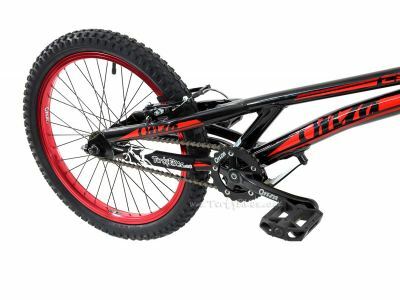 They have been specifically designed to be good for trials riding, so it will be much easier for that than other styles of bike. Hope that helps. Thanks, Flipp. Hi Wilf - thanks for your question. The Monty 207 is a great option for approximately 6-10 year olds (roughly 1.15m (3ft9) to 1.45m (4ft9)). We are currently out of stock of this bike, but the next batch is expected mid-October). Hope that helps. Thanks, Flipp. Hi Zack - thanks for your question. It's good to hear you're having a good time with your bike! You wouldn't be able to fit disc brakes to it as the hubs, fork and frame do not feature any mounting points for them. Thanks, Flipp. 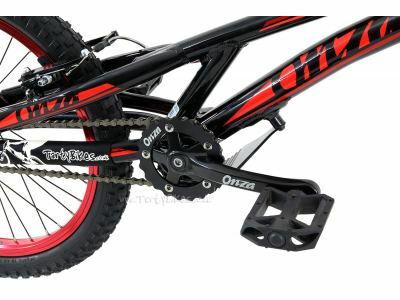 would the onza tyke be an ideal bike for a 13 year old boy? Hi Blake - thanks for your question. Whether this is ideal for you or not depends more on your height than your age. The recommended size range for both models is listed in the product description. Hope that helps. Thanks, Flipp. 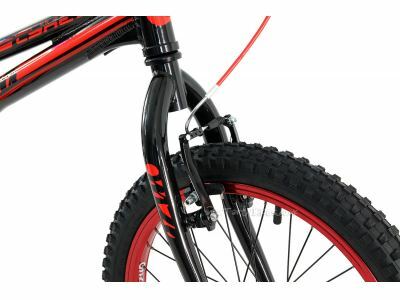 What is the width of the rear tire? and would i be able to fit a wider tire? if so whats the widest i can go? Hi Ross - thanks for your question. The tyre on the bike is a 2.25" model, and you could fit a wider tyre in the frame but there are not many suitable tyres on the market. The widest 20" tyre for trials usage seems to be the 2.25" model. Thanks, Flipp. Would I be able to fit a thicker and wider tire to this bike?? for example the onza birds tire?? Hi Ross - thanks for your question. Unfortunately you wouldn't. The Tyke uses a 20" tyre and the Bird uses a 19". 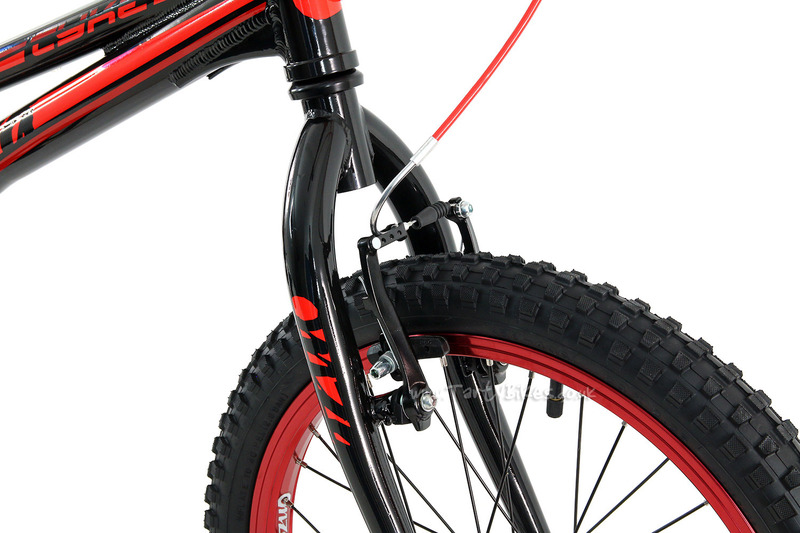 The tyre that comes on the Tyke is about the widest available in 20" sizes. Thanks, Flipp. what age a child can use this bike? Hi Axel - thanks for your question. It's more down to size than age - this could be too big for a very small 11 year old, but fit a large 9 year old just fine. The recommended sizing range is listed in the product description. Thanks, Flipp. Hi well I'm using trials bikes for jumps that are over four foot high should I been fine on this bike? Hi Flett - thanks for your question. These bikes aren't tailored for that kind of riding and you would likely find it easier on a bike more suited to it, but these should be just fine in terms of strength. Thanks, Flipp. Hi Alice - thanks for your question. The Sting would be a little easier to manoeuvre at his size, though he would be just about Ok on a Tyke if you wanted to go for an option that he wouldn't grow out of so quickly. The Tyke could be made a little smaller and more suited to him by fitting a smaller stem, if it does prove to be too big. Hope that helps! Thanks, Flipp. Hi, I was wondering if you could tell me what material the pedals are made from, and also, if I plan to ride in 'skater shoes' do you think platform pedals would be more beneficial? Thanks. Hi Leila - thanks for your question. The pedals on this bike have steel cages and axles, with a plastic central body. Which type of pedals to use is entirely up to you. Many riders use skate style shoes on cage pedals just as happily as platforms - it's whichever you prefer the feel of. Hope that helps. Thanks, Flipp. Hi Everyone I`m big fan of Danny MacAskill so i wanted to learn & do stunts . will you ship the bikes in india ? & if you so whats the shipping amount you charges ? And one Question more i`m 5 feet 6 inches tall will this bike fits to me ? Hi there - thanks for your question. Shipping to India is no problem. To calculate your shipping costs, add your items to the basket and go to the checkout. Entering your address will let you see what postage options are available to you and their relative costs without committing you to the order. 5'6" will be fine for the black and blue version of this bike - the orange might feel a little cramped, especially if you grow at all. Hope that helps. Thanks, Flipp. i am wondering if i am too tall for this bike, i am 6'3 and i need to know if i am a suitable height for this bike. Hi Daniel - thanks for your question. The black and blue option would be fine for you, though most people at your height find a 26" bike more comfortable. Hope that helps. Thanks, Flipp. Do this bike fit to me, i am around 1.6m. I like the blue one and i am going to start with trails(beginner). the brakes on this bike are they good and easy to push? Hi Marius - thanks for your question. This bike would fit you perfectly, and the brakes are very easy to pull. We spend time making sure the bike is set up perfectly before sending it out, so the brakes are very powerful, and feel very "light" at the lever. I hope this helps. Thanks, Flipp. Hi Nick - thanks for your question. This bike is great for beginners, though if you learn fast and can see yourself wanting to upgrade parts on your bike in the near future, spending a little more money might help. The Tyke has a 20" rear wheel, which means you will be a little limited for choice in tyres, and you would also need to use Evo 2 adaptors to mount hydraulic brakes. You would also get sealed bearing in more expensive models, increasing life-span and reducing maintenance. Having said that, this is a great bike for the money and it won't disappoint you. Unfortunately it comes down to what you can afford. The more you spend the better the bike will be, but that doesn't mean the cheaper ones are bad. I hope that helps. If you'd like more detail, please get in touch! Thanks, Flipp. Hi Akash - unfortunately we are unable to offer free delivery to India. Thanks, Flipp. Hi - The Orange bike is fitted with a 145mm stem, making it ideal for younger/smaller riders from approximately 1.35m (4ft6) to 1.65m (5ft6). 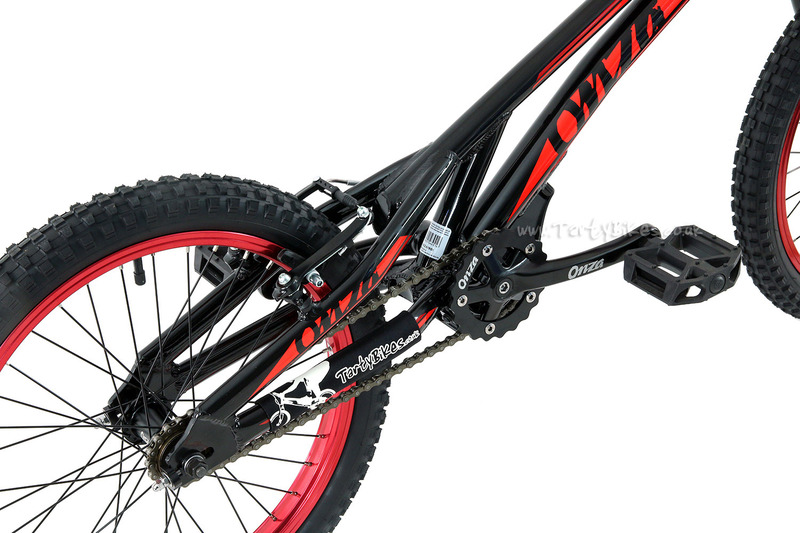 The Black bike is fitted with a 165mm stem, making it suitable for taller riders from around 1.50m (5ft) to 1.80m (6ft). Thanks. can u tell me the package demensions? Hi Golan - the box dimensions are: 1300mm x 600mm x 180mm. Hope that helps. Thanks, Flipp. Hi Adam - thanks for your question. Unfortunately you cannot. The frame, forks and hubs do not have disc mounts meaning there is no way to attach disc brakes. Thanks, Flipp. Hi Akash - yes, we can deliver to India no problem! Thanks, Flipp. 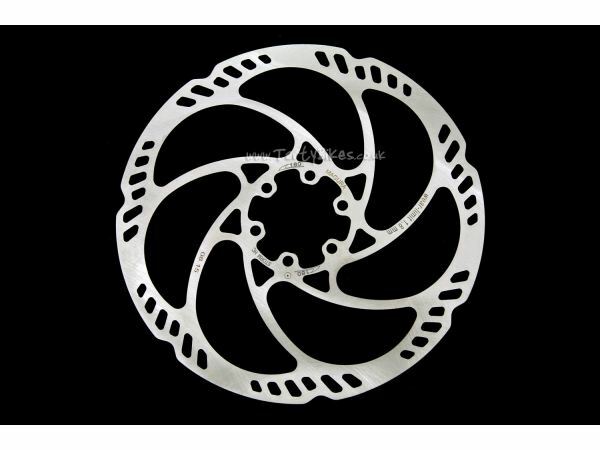 Hi Andreas - yes, this freewheel will fit to your bike just fine. Thanks, Flipp. How much would that cost in overall in euros to ireland ? Hi Sean - thanks for your question. If you add the items you want to your basket and go to the checkout, you can see which postage options are available to you and how much they cost. 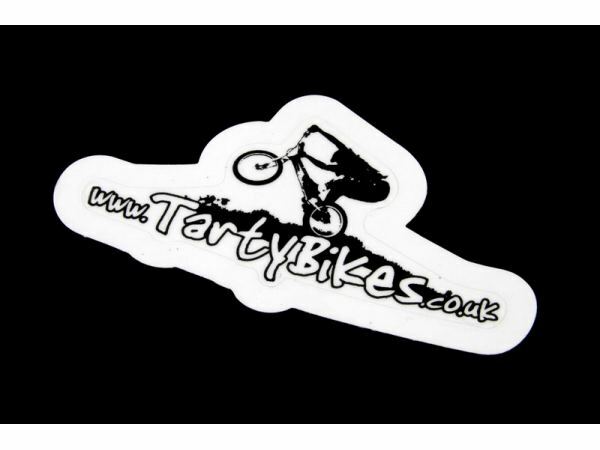 We have a currency converter here: http://www.tartybikes.co.uk/pages/terms_and_conditions.html. Hope that helps. Thanks, Flipp. Hi Dawson - thanks for your question. The bottom bracket in this bike is fine. We've encountered no issues with them, and no customers have made any mention/complaints about them. Hope that helps. Thanks, Flipp. Hi Roy - thanks for your question. Unfortunately disc brakes cannot be fitted to this bike. Neither the hubs, nor the frame or fork have the necessary mounts. Thanks, Flipp. Is it possible to retrofit a freewheel in the front with a fixed gear in the back on this bike? Hi Brandon - it would be possible, but you would need to purchase new cranks and rear sprocket too. The current cranks use four bolts to hold the chainring on, whereas you need threaded cranks to use a front freewheel setup. Hope that helps. Thanks, Flipp. Hi Gloria - thanks for your question. It would be very close, though could be possible. If your order is placed today, and you selected FedEx Priority shipping, it could arrive on the 24th. Looking back at our previous shipments to Italy they are usually delivered the next working day. FedEx economy usually takes around 3 working days, so would likely arrive a little late, unfortunately. Hope that helps! Thanks, Flipp. Hi Lucy - thanks for your question. There has been a slight delay with our suppliers and they are now expected in stock in the third week of December. Thanks, Flipp. Hi Simon - thanks for your question. We are expecting our shipment of these on 11/12/13, so they should be up on the website to order by 12/12/13. Hope that helps! Thanks, Flipp. Hi Daniel - thanks for your question. Yes, we ship to the US pretty much every day so that is no problem at all. You can calculate shipping costs by adding the item to your basket and putting your address in at the checkout. This does not commit you to the order. Thanks, Flipp. Hello, i want to start with Trial and want to know if that bike would be fine for me. I'm about 168cm high, and does make the 145mm stem on the orange bike that much of a difference as the 165mm stem on the black one? Hi Patrick - thanks for your question. This bike should be absolutely fine for you! The 145mm stem, even though it is only 20mm less, makes a surprisingly large difference to how the bike rides. You might not notice having only ridden one, but if you rode one, then switched to the other you would definitely feel the difference. I'd probably advise the longer stem as that is a length most people of your height find comfortable, but it's all down to personal preference! Hope that helps! Thanks, Flipp. Hi Reyn - thanks for your question. This bike should ride very similarly to the Rip as the frame has the same geometry. The specification is also fairly similar - the main difference to how it rides will come from the slightly shorter stem on the orange version of the Tyke. As for shipping, yes we do. To calculate the shipping costs, add your items to the basket and go to the checkout. Putting your address in will let you see how much it will cost without committing you to the order. For other postage information, see here: http://www.tartybikes.co.uk/pages/postage.html Hope that helps. Thanks, Flipp. Hey, I'll start with trialbikeing but is this bike to small for me? Onza tyke? i am 174cm high. Hi Julius - thanks for your question. You should be absolutely fine on this bike. I am 176cm and am most comfortable on a bike that is actually slightly smaller than this (though most people my height prefer something a little bigger, such as this). If you are concerned about it being to small, going for the black version with the 165mm stem will make more than enough room. That is quite a long stem on an average sized 20" bike, and also riser bars. Hope that helps! Thanks, Flipp. Can you tell me how wide the rear tyre is? Hi Lewis - thanks for your question. Unfortunately we can't! We don't actually have these bikes yet, so we only know what we have been told - which isn't an awful lot. Other bikes with 20" rear wheels have 2.4" wide rear tyres so it will likely be around that, but that is pure speculation. Thanks, Flipp. This is my first trials bike I absolutely love it but I have to change the grips because they were horrible. In the description it said the V breaks were power full witch there not(when there fully locked I can still move). But other than that it's a awesome bike for beginners. Hi Owen - Thanks for your detailed review. I'm glad you like your new bike! Grips are quite a personal thing, with some people preferring rubber, some preferring foam, some preferring thicker or thinner grips and so on. As long as you have found some that are comfortable for you then that's the main thing. Regarding the brakes, as long as your rims and brake pads are kept clean the brakes should work well. If you'd like to improve their power the Onza Ice Pro V-Pads would be a great upgrade. Thanks to the service of Tarty Bikes, the bike was deliverd on time in the Netherlands for my sons birthday. Hi Bertram - I'm glad to hear that the bike arrived in time for you. I hope your son likes it! Great value entry-level trials bike! Ideal for smaller riders, 1.20m (4ft) - 1.50m (5ft).